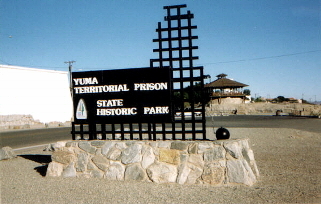 Yuma, Arizona, is known for the most famous prison in Old West history. 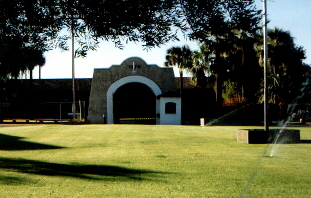 Located on a peninsula overlooking the Colorado River, it is today a tourist attraction. In a future update, we will provide a bit more history, but for right now, here are some fascinating photos of this historical treasure. 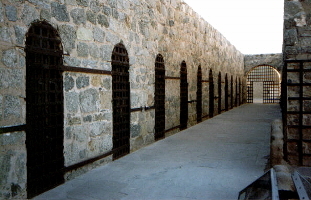 The entrance to the prison, which is the white building on the left. Note the ball and chain at the right of the sign. Through this gate passed some of the most notorious criminals in the West. Left photo is looking down the double row of cells and right photo is of the left section of the double row. All cells are constructed of this rock. Left photo shows a typical bunk layout with three tiers. 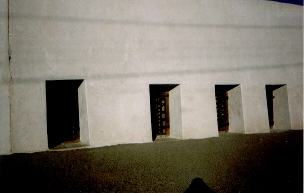 Right photo is of the women's quarters. Yes, they did have women prisoners housed here. This prison was also used as a fortress. 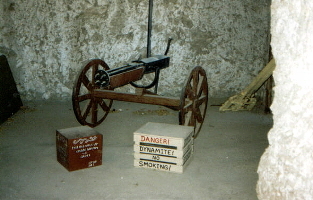 Here is one of the cannons, situated in an "isolation cell." The isolation cells were holes carved into the rock. They had solid wooden doors, and when shut, the chamber is in total blackness. 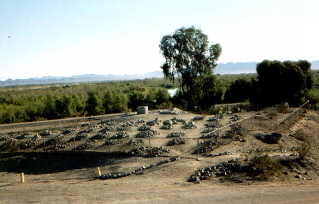 This cemetery is the final resting place of hundreds. It is located outside the prison walls, just to the right of the sign shown in the first photo above. It overlooks the Colorado River, and the tree is at the river's edge.